Welcome to St. John the Baptist's website! 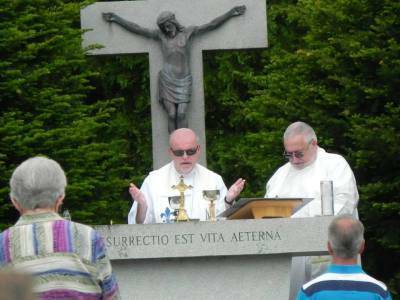 Here, we share information, news, and inspiration as part of the New Evangelization in our historic parish – which has been ministering to the people of the Suncook Valley for over 140 years. 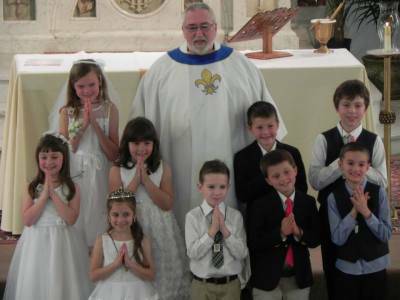 Part of the Diocese of Manchester, NH, we serve parishioners from Allenstown, Pembroke, and Epsom, as well as Deerfield, Hooksett, Bow, Concord, and beyond. New families are welcome! See Mass Times below. If eternity has no beginning and no end, then Eternal Life has already begun. The kingdom of God is truly at hand! We each ask ourselves, "How is my immortal soul?" Believing in Jesus Christ and faithful to the Teachings of his Catholic Church, we strive to lovingly serve God and neighbor – and ask the Lord's forgiveness for the times that we fail to love. Christ, who is Love Incarnate, gives himself perpetually to us in the Eucharist and mercifully offers us redemption, the way to eternal joy with him. 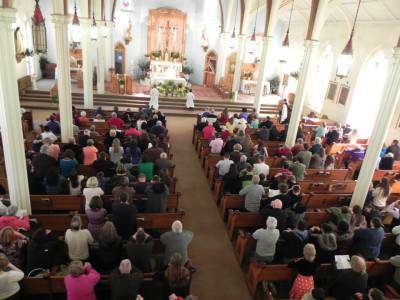 If you’ve never been to our church, or if you haven’t been in a while, we hope that you come and participate with us in the Sacred Liturgy of the Mass. for the purpose of becoming free. becoming who we are created to be. in God's eternal life of love. so that you may joyfully receive the blessings of Christ Our Lord. Thank you to all of you who support our parish and help maintain our lovely old church and busy Parish Hall. Your contributions help us to continue to spread God's Word and live out God's Love! You can safely and easily donate online by clicking HERE. Our roof has been patched up for the last several decades, but is now in need of major repair. Water pours in the northwest corner every time it rains! We need your help! 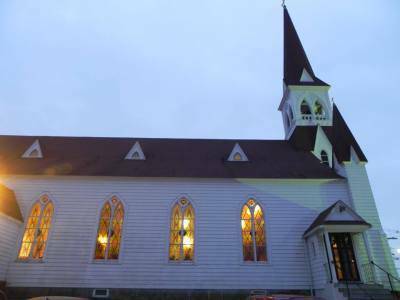 Please assist us in raising the funds required to keep our beloved church building safe and our sacred traditions continuing here for generations to come. For whatever you can give, we are grateful! During the holy season of, there will be a second collection for the roof fund. We are calling this drive "Lifted up for Lent" and we hope that you can contribute in whatever way that you able. 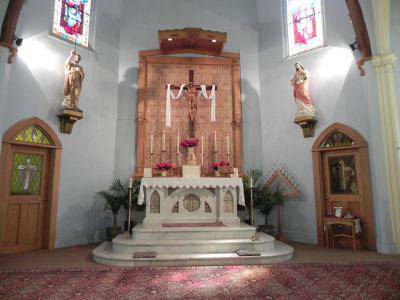 Please place your donation in the 2nd collection basket, (if attending Holy Rosary in Hooksett, please write "SJB roof fund" on an envelope) or you can deliver your contribution to the School Street rectory during office hours, or mail it to 10 School St., Allenstown, NH 03275. You can also donate safely and securely online! Just click "Online giving" in the top menu or go to stjohnsuncook.weshareonline.org, then scroll down to click "make a donation" under "roof". Thank you and God bless you! please see our weekly online BULLETIN! We invite you to browse through our website to learn some history (including photos) get the latest news from the Vatican, or read the Scripture for today. Discover our liturgical ministries, social organizations, and local charities that we help – and consider getting involved. Let us richly live our lives of faith. Bulletins are available to read by clicking under the "publications" menu item and going to "bulletins"
Thank you! And may God bless you in every season. FRIDAY at 7:30 AM with Rosary at 7 AM. 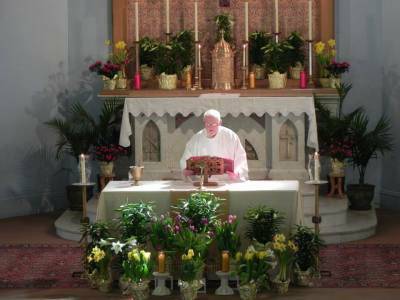 On First Fridays the Mass is followed by Eucharistic Adoration hour. 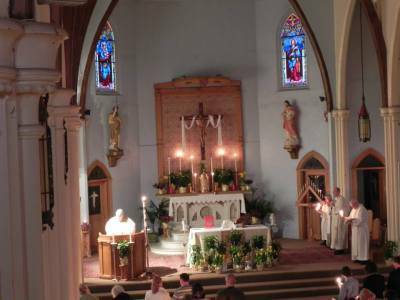 LATIN MASS on the 1st Sunday of each month at 11:30 AM. CONFESSION: Saturday at 3 PM. Most of our photographs are courtesy of Dan Chase, a volunteering parishioner. If you have old pictures or photos of current events, news items, or updates that you would like to share here, or on Facebook, send them to [email protected] (Don't forget the "t" in St !) All other questions regarding Masses or other particular information from the office should be directed to 485-3113 or by email [email protected] Thank you! We are looking for volunteers to help us with the Facebook page. You don't even need to be computer savvy – just eager to learn and willing to do what you can for this ministry work. Please contact [email protected] if you have any questions or if you're interested in lending a hand – thank you!